There are a couple very distinct differences between architectural speakers and traditional box speakers. For starters, an architectural speaker are installed into a wall or ceiling, so it does a great job of remaining hidden and not intruding into your living space. Traditional box speakers live alongside the rest of the furniture in your home. Most architectural speakers will have an open back, while the traditional box speakers have a fully enclosed cabinet which may or may not have a bass reflex port tube. With each style of speaker, they have pros and cons. As we just mentioned, architectural speakers are installed into the wall or ceiling and will consist of similar components as those used in a traditional box style speaker. The shared components include the tweeter, woofer, input binding posts, and crossover network, but because architectural speakers lack a cabinet structure, they'll use a plastic baffle (to keep the weight down) and drywall mounting clips. Other possible components include an aimable tweeter, treble or bass mod switch, removable grille and in some cases an installation kit or backer box. Since architectural speakers are designed to be installed in a wall or a ceiling, they usually don’t have a boxed enclosure. This is called an “infinite baffle" design which essentially means that when you seal the perimeter of the speaker to the wall or ceiling, your walls and ceiling act as the enclosure or speaker “box” by separating forward firing sound waves from rear firing sound waves. This is important to separate the sound waves to prevent any phase issues in the sound quality. What is a traditional box speaker? Like mentioned above, the main components include a tweeter, woofer (or combo of woofers), input binding posts, a crossover network, and it will all be enclosed within a cabinet. Depending on the design it may also have a bass reflex port tube. Most traditional box speakers also have a grille cover which usually is made up of a wooden, metal, or plastic frame which is covered by acoustically transparent cloth. If it’s a bookshelf speaker of a reasonable weight, it might have threaded mounting inserts on the rear for wall-mounting, or a single threaded insert on the bottom to securely attach it to a stand. If it’s a floor-standing tower speaker, it most likely comes with a set of feet outriggers to provide more stability. Unlike the infinite baffle design speakers, a traditional box speaker performs best in an open space. While it might be convenient to save space by putting a bookshelf speaker into a cabinet, doing so can lead to unwanted standing sound waves and resonances, especially if the bass reflex port is on the backside. Some speakers come with a port tube plug. Using this plug will reduce the bass response of the speaker. Plugging the port can reduce standing waves and resonances if you absolutely must place your speaker into an entertainment cabinet. Also if your room acoustics create a muddy tone with your sound, plugging the port can be advantageous. In most situations a non-plugged rear ported speaker is best served with breathing room behind to allow the bass to reflect off the back wall to fill the room with bigger bass response and ultimately increasing the sound stage. And as always, you’ll want to make sure your tweeters are aimed toward your main listening position for optimal stereo sound field and imaging. What are the different types of architectural speakers and which scenario would I use for each? There are essentially two types of architectural speakers. The different variations of architectural speakers accommodate unique setups and different uses depending on what your room needs. LCR – Also known as Left, Center, Right. It also falls under the “in-wall” category. This type would most commonly be used for your front sound stage. A typical driver configuration would be an MTM format consisting of 2 woofers and a tweeter. Depending on your room layout, you may have all three front speakers vertical, or horizontal, or a combination of the left/right positioned vertical and the center horizontal. They also can be used for ear-level surround channels in a 5.1 or 7.1 setting. In-Wall – The in-wall will generally have the same use as the LCR. Use them for front sound stage and ear-level surround speakers. To add some impact for your center channel, you may also consider using the LCR for your center speaker and use a regular in-wall speaker for the remaining speakers. Better yet, since the front sound stage is where a majority of the sound effects happen during movies, you might also consider going with LCR for your front sound stage and use regular in-wall speakers for your surround channels. In-Ceiling – The in-ceiling tends to have the most versatility in terms of application. Aside from multi-room whole-home distributed audio, they allow a ton of flexibility for building your home theater surround system. 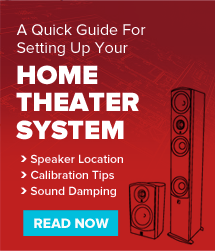 While it's not necessarily ideal to use in-ceiling speakers for your entire system, it is certainly not uncommon in certain cases. Generally though, your front three speakers will sound best if they are at ear-level, like a tower, bookshelf or in-wall. If your couch is against your back wall, in-ceilings can be a great option to help with your rear channel surrounds. Also, in-ceiling speakers are the first choice for overhead channels to expand a traditional 5.1 or 7.1 home theater system into the latest sound formats of Dolby Atmos and DTS:X. Now that you’ve seen some of the different variations between the two types of speakers, here are some of the pros and cons between them.